Carl Crawford plays outfield for the Los Angeles Dodgers. Crawford has more triples than any other active baseball player. Crawford was drafted by the Devil Rays in the second round (52nd overall) of the 1999 Major League Baseball Draft. On December 8, 2010, Crawford signed a 7-year, $142-million contract with the Boston Red Sox. On August 25, 2012 he was traded to the Los Angeles Dodgers. 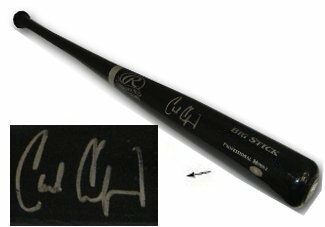 Carl Crawford has hand signed this Rawlings Big Stick Black Bat. MLB Hologram and Certificate of Authenticity from Athlon Sports.